It’ll be a while before we get to see the remake from the dude who made Safety Not Guaranteed, but now you can refresh your memory of the original in high def. IDW kicks off their celebration of Doctor Who’s 50th anniversary with this monthly, 12-issue series which will highlight each of the 11 Doctors (with the 12th issue being a surprise of some sort). 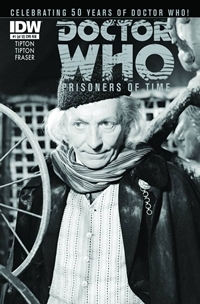 Issue #1 of course highlights the First Doctor, originally played by William Hartnell. The series is being written by Scott and David Tipton, and you can read an interview with artist Simon Fraser right here. The issue also includes an article about the First Doctor penned by Big Finish Productions producer, director, and script editor John Ainsworth. This week’s episode takes a look at the blustery conditions on Neptune. Your umbrella isn’t gonna make it. NBC’s Christian Slater-starring My Own Worst Enemy didn’t fare too well back in 2008, but the network is nevertheless trotting out yet another take on the Jekyll and Hyde story. This time it’s a neurosurgeon who is taken over by his dark alternate personality every night at 8:25. Hey, at least Hyde is punctual! “Reese is kidnapped by an old acquaintance who is plotting a destructive act of cyber warfare.” Word is, that “old acquaintance” is Reese’s ex-partner. Today is the 27th anniversary of the Space Shuttle Challenger disaster, but this special takes a look at another Shuttle that eventually met with tragedy. Obi-Wan teams up with Bo-Katan, voiced by BSG”s Katee Sackhoff.